Welcome to the Under the Sea Blog Hop. Thank you for joining us for an underwater adventure Under the Sea! You should have arrived from Alicia's Blog but if you didn't Connie Can Crop is the first stop in this hop. This is a one day blog hop and we appreciate your leaving a comment for all of these amazing crafters. We have a WONDERFUL sponsor! What do you need to do to win? Easy... become a follower of each of the fabulous blogs in this hop and leave each of them a comment letting them know what you like best about their projects. You will have until 10 pm Sunday to finish the hop and leave your comments. Winner will be announced on Wednesday 7/20/16 at Connie Can Crop. Be sure to follow everyone and leave a comment along the way! For my project I made a cute card. I cut out the fish, whale and turtle out on my Silhouette Cameo. I also created the seaweed, coral reef and sandy ocean bottom. To give some life to my card I used foam squares on parts of the seaweed and added some teal sequins. Up next is Pam, Please go to my line up and select her blog. what a precious card! Love all the characters! great job! Absolutely cute-atious! (Yep! That's my new word. It works. Don't judge...) Love your card and that you brought it to "life". Great hopping with you. super adorable ! Love it! As always love hopping with you and see you next time! Such a cute card! That turtle is adorable! Sarah, this is just adorable. I love those little sea creatures. Perfect use for the sequins...they look like bubbles. It was a lot of fun hopping with you! 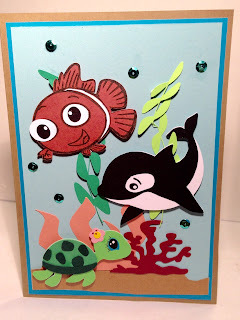 I love all the adorable sea creatures you used on your card - TFS! Super cute card! Love the colorful fish! Your card is soooo adorable!!!! I love it! LOVE your card! Great job putting it together. Enjoyed being in the hop with you! Nice card. I love the seadorable animals you chose. So cute, TFS and have fun during this hop. Good luck. super cute I love it! Oh my gosh!! This is totally adorable!!! Thanks for joining this hop!